Based at The Ashcombe Volleyball Centre, The Ashcombe School, Dorking, Surrey. 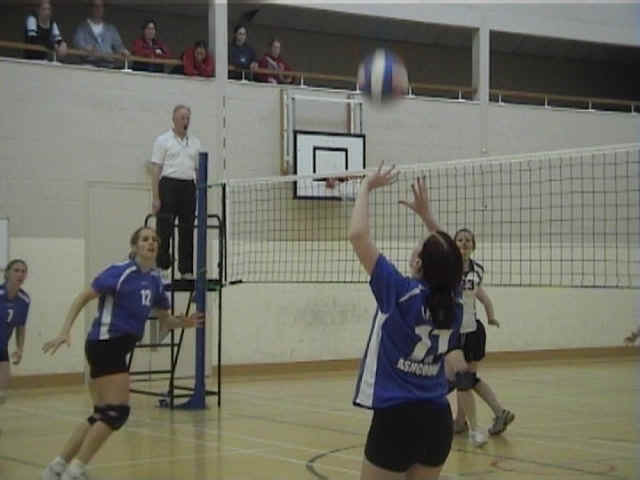 Ashcombe Volleyball Club celebrated 25 years as National League and Cup Champions in 2000 and 2001. Sunday 15th April 2.00.p.m. at Dorking Sports Centre Ashcombe 1 v Tameside A 3-2 win for Ashcombe keeps Ashcombe in Division 1 next season. Final game of the season was a 3-0 loss to Plymouth who now move into NVL Division 2 next season. Want to play National League Volleyball? The Ashcombe Volleyball Centre, Dorking, Surrey. Training continues throughout the summer and we welcome players of all ages and abilities as well as boys and men to join our social off season sessions. 2 or more courts available. �2.50 per session for non-club members. Ashcombe 1 lost 3-2 to Cleobury in the semi- final of the National Shield Competition. Ashcombe Under 16 girls lost 3-0 to Tameside at the finals of the National Competition held in Sheffield on Sunday 22nd April. The game was played in front of a crowd of over 300 people at The English Institute of Sport. The team played well but were certainly overawed by the size of the venue and crowd and the nerves showed in their performance. The volleyball was of a very high standard and the players are all ready to train harder for next years competitions. Ashcombe Under 18 Boys reached the semi finals losing 2-1 to Boswells from Essex. Ashcombe Under 18 Girls reached the semi finals losing 2-1 to Tettenhall from Birmingham. Ashcombe Volleyball Club is now Club marked!! The Award shows that a club is working correctly with junior players at all levels and providing a safe environment for players. Now seeking Clubmark 2 and 3. Ashcombe hope to be the first volleyball club in the country to attain Club Mark 3 status. Playing home games on Thursday evenings at The Ashcombe Centre, Ashcombe welcome women players of all standards to play local league volleyball. Playing home games on Monday evenings at Durrington High School, Worthing, Ashcombe welcome women players of all standards and ages to play local league volleyball. Saturday 23rd June - Ashcombe 4's Tournament and Junior tournament for all ages between Under 11 and Under 18 teams. Held on grass courts at Dorking RFC, The Big Field, Brockham, Nr. Dorking, Surrey. Saturday 23rd June - Ashcombe Annual Club Dinner. �10.00 for dinner, disco and camping on site. �5.00 for camping and Disco only. Sunday 24th June - Ashcombe 6's Tournament. 4 Divisions to suit all standards. Friday 14th July 2006 Ashcombe junior players from Durrington High School play exhibition matches in front of the Olympic Committee Road show and large crowds on Brighton Seafront. Olympic Gold Medallist James Cracknel was with the Olympic group watching the players. A whole bunch of goodies have arrived at Ashcombe after being awarded a Barclays Award. Coaches jackets, fleeces, players t-shirts and baseball caps, 1st aid kit, sports bags and much more to award Ashcombe's involvement in Junior volleyball.